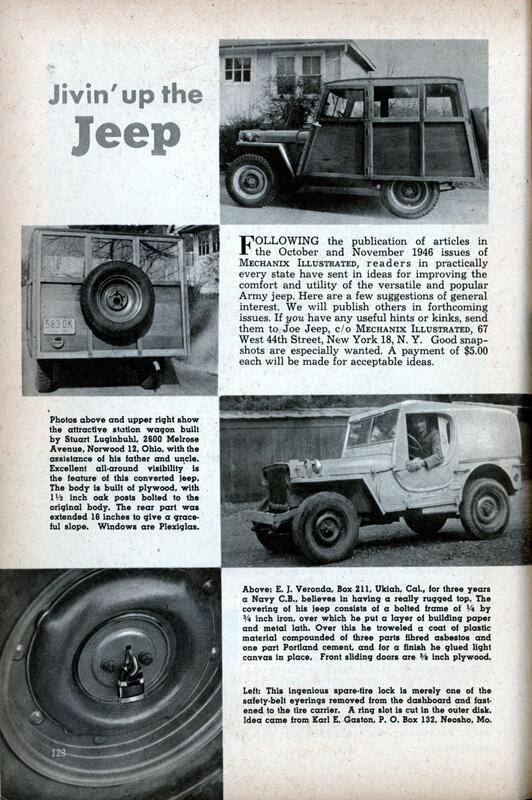 FOLLOWING the publication of articles in the October and November 1946 issues of Mechanix Illustrated, readers in practically every state have sent in ideas for improving the comfort and utility of the versatile and popular Army jeep. Here are a few suggestions of general interest. We will publish others in forthcoming issues. If you have any useful hints or kinks, send them to Joe Jeep, c/o Mechanix Illustrated, 67 West 44th Street, New York 18, N. Y. Good snapshots are especially wanted. A payment of $5.00 each will be made for acceptable ideas. • Photos above and upper right show the attractive station wagon built by Stuart Luginbuhl, 2600 Melrose Avenue, Norwood 12, Ohio, with the assistance of his father and uncle. Excellent all-around visibility is the feature of this converted jeep. The body is built of plywood, with 1-1/2 inch oak posts bolted to the original body. The rear part was extended 16 inches to give a graceful slope. Windows are Plexiglas. Above: E. J. Veronda, Box 211, Ukiah, Cal., for three years a Navy C.B., believes in having a really rugged top. The covering of his jeep consists of a bolted frame of Va by 3/4 inch iron, over which he put a layer of building paper and metal lath. Over this he troweled a coat of plastic material compounded of three parts fibred asbestos and one part Portland cement, and for a finish he glued light canvas in place. Front sliding doors are 5/8 inch plywood. Left: This ingenious spare-tire lock is merely one of the safety-belt eyerings removed from the dashboard and fastened to the tire carrier. A ring slot is cut in the outer disk. Idea came from Karl E. Gaston, P. O. Box 132, Neosho, Mo. Right: A small cab instead of a full body satisfies the needs of Richard H. Hicks, 238 Clinton Avenue, North Plainfield, N. J. The top is made of 1/4 by 1/2 inch slats covered with canvas; the sides are 1/4 inch plywood. Rear window is sheet plastic. Open back is convenient catch-all for cargo. Below: C. R. Day, 3231 Imperial Street. New Westminster, British Columbia, retained the canvas top of his jeep and added plywood doors and a fixed plywood rear section. Rear window is from an old Buick. 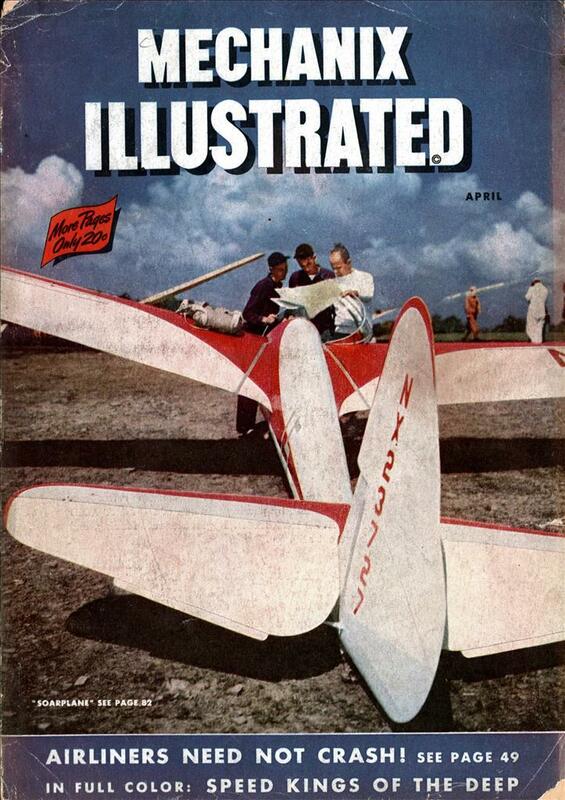 Flapping of canvas top was eliminated by running wood strips from windshield to rear bow. Below: Unlike the job on the opposite page, this station wagon by John A. Bennett Jr., 11036 Whittier Avenue, Detroit, Mich., conforms to the original lines of the jeep. The framework and the doors are of maple, the panels plywood. The top is made of 2 inch slats, packed with cotton to give it shape and then covered with canvas. Below: Leo S. Hoyt, Tide Mill Road, Hampton, N. H. used sheet iron for the curved top and Masonite for the doors of this elegant looking “wrecker,” which handles any passenger car with ease. He moved the rear seat alongside the driver’s seat (as in photo in lower right corner) and can carry two people in addition to himself. One jeep is covered in “three parts asbestos and one part Portland cement”. I’m sorry for whoever this was: he had no idea what he was doing was dangerous. Still, I suppose driving around in an asbestos-lined car isn’t as bad as living or working in an asbestos-lined building. I lived in several military houses that had asbestos/cement siding. It’s durable, at least. And as long as you don’t start knocking them apart, asbestos/cement/etc. tiles and sidings and whatnots are safe. Just take proper precautions (disposable overalls and respirators etc.) if you need to demolish anything containing asbestos. Jari » Not really. Its a big problem in Australia where asbestos-cement was a common building material. They’re still crawling out from underneath it. The stuff weathers and releases fibers. John: Australians really used that stuff a lot. Asbestos-cement tiling was relatively popular here in Finland at 60-70’s as an outer wall cladding, so they don’t weather that much. What I wrote was from instructions for removing and handling of those claddings from the Finnish building heritage website. Basically removing them intact and packing them properly is the key. While wearing disposable overalls, gloves and P3-class respirator.